We have enjoyed another busy week of playing and exploring. I hope you enjoy looking through some of our photos. 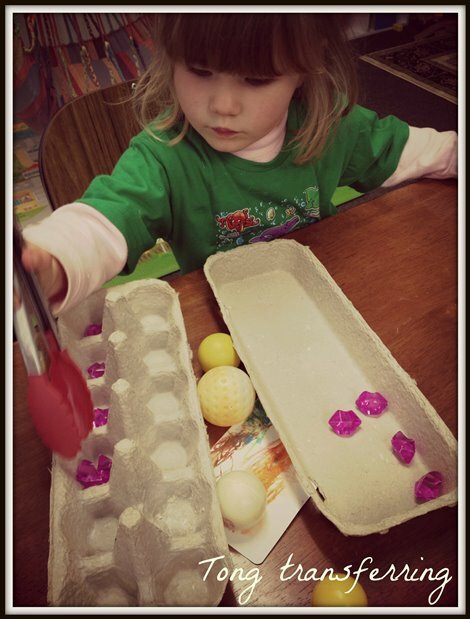 Lucy absolutely loves transferring different things using her little tongs. It is so wonderful that you can get small, child sized versions of many household items these days. It must feel so empowering for our littlies to master skills they see us using everyday, all on their own. I can really see how much Lucy cherishes her accomplishment in this and is even now attempting to pass on her knowledge to her little sister by constantly showing Penny how they work. I set up this lovely rice invitation for the girls. Lucy discovered it whilst Penny slept and immediately started scooping the rice out of the container into the little cups I provided. 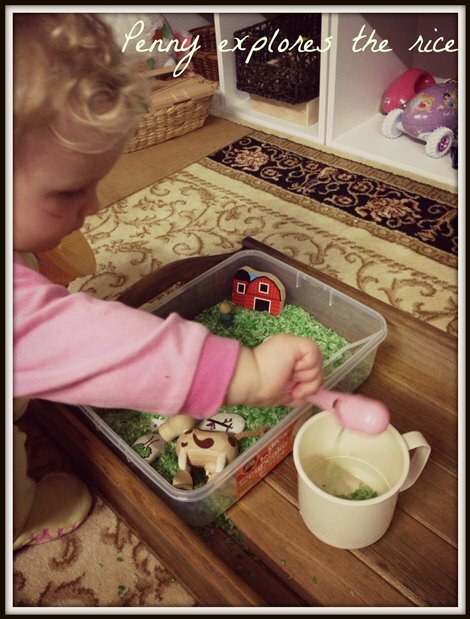 She paid no attention to the objects I had carefully placed into the box, instead she showed wonderful concentration for quite some time, filling up the cup with her little scoop before tipping the rice back into the container. When she buried the little family under the pile of rice she tipped in, she was very concerned for their well-being and thus started a long period of imaginative story telling where one of the little people would be lost in the ‘long wavy grass’ and had to be rescued. I loved that I didn’t need to direct her to play. I had envisaged that the little objects in the rice would be the main attraction. 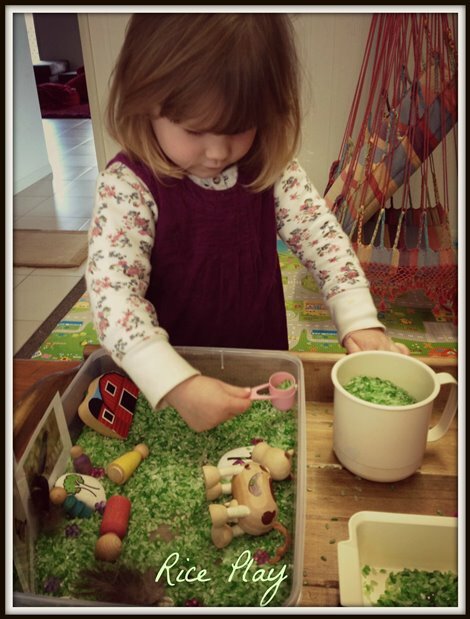 I had pictured storytelling and imagination before discovering the rice so I was surprised at the way this play unfolded but I was happy to let Lucy explore and satisfy her own interests and investigate the rice instead. I truly believe that her engagement with the little objects after her scooping and pouring was much more organic and authentic as a result. Funnily enough, when Penny had her turn with the rice later that day, she engaged with it in an almost identical way, first exploring the rice and then discovering the objects. It goes to show that when it comes to play, children have their own agendas and don’t need to have an adult’s perception of play impressed upon them. Lucy loves action. She is all about big, whole body movement or gross motor skills. 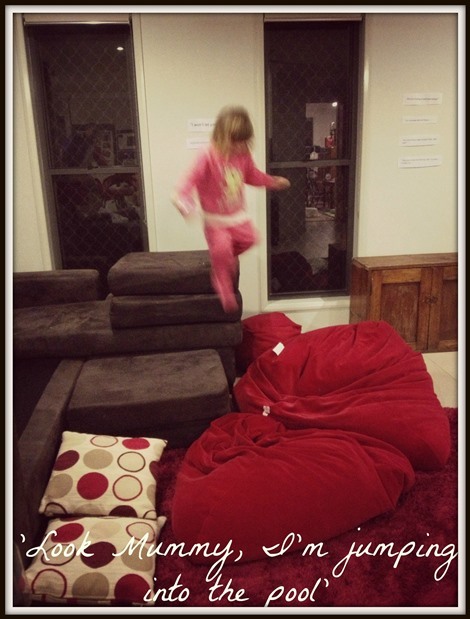 Running, jumping, spinning around, doing roly polys; these are all favourite activities for Lucy and having a background in teaching physical education, I love this about her and try to foster it whenever I can. 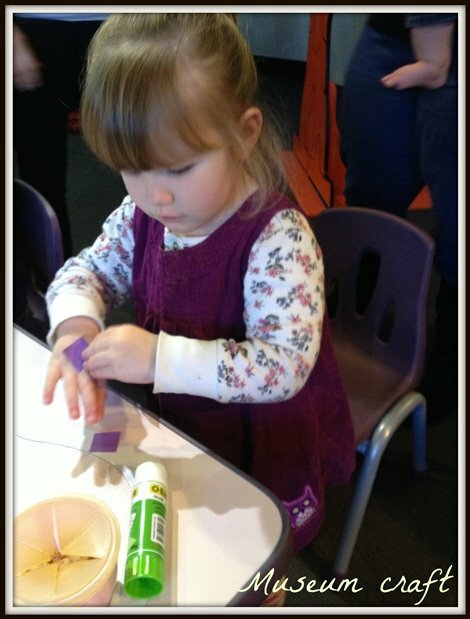 Even when Lucy is engaged in fine motor tasks like drawing and painting, her movements are big and fast. She struggles with intricate activities and becomes easily frustrated with these tasks. Setting up our couch cushions into a variety of arrangements such as this gives Lucy the freedom to stretch out and move BIG! She has started to incorporate some imagination into these sessions which is really lovely. And of course Penny loves scrambling over the cushions also. Back at the museum again this week and with it being NAIDOC week in Australia (a week which recognises Australia’s indigenous community) the theme for this week’s story time was Indigenous. They showed the children some clap sticks, a didgeridoo and a boomerang and allowed them to hold them and have a go at using them. Then they gave each child a cardboard boomerang with little pieces of cut up paper and glue for them to mosaic a design onto them. True to form, Lucy happily glued one piece of paper onto the boomerang before wanting to explore the glue properties a little further. She proceeded to glue the paper onto her hands. I allowed her to do this but was conscious of the fact that this was a public area with all these materials provided by someone else. I really struggled with my own desire to do things ‘right’ in the eyes of others. I would be interested to know what you would have done in this situation. Would you have allowed your child to use these materials in this way or instructed her to use them as intended? So, that was a little taste of our play this week. Stay tuned for my upcoming blog on our first project. I’d love to hear about what you got up to this week. I hope you all had a good one. This entry was posted in Play and tagged craft, gross motor skills, montessori, Rice play, transferring with tongs on July 20, 2013 by peacefulparentsconfidentkids.